It's been a hot minute. Work has well, been work, therefore my dedication to the blog has been slacking. But the holidays are coming up, and I love a good gift guide, so I figured it was time to pinch off the acrylics and get typing. The skinny on moi: I love dainty pieces. I'm not a huge statement necklace person, unless by "statement" you mean a v. delicate chain and a tiny charm. I've recently gotten into embellished chokers, but when it comes to adorning my body, the smaller, the better. You'll see a lot of there here, as well as chokers. Chokers for EVERYONE! Hopefully, you'll find something that caters to your personal tastes, or at least the person you're buying for. Enjoy! I was introduced to Bare Collection in 2014, after I attend a press trip in which I got to attend the Emmy Awards. Stylist Ilaria Urbinati allowed each attendee to pick out a piece of jewelry for the show, and we were all thrilled to learn we'd get to keep the piece. I fell in love with the Arithmetic Studs. 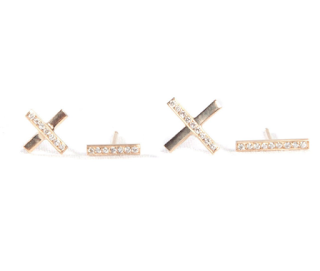 They're the perfect mix of glam, but still small enough that I can wear them on a regular basis. I have the small studs, which, to me, are the perfect fit. I ended up losing my "X" and the cuff it came with, so I plan on picking those up again for my 30th birthday. I wear a necklace with a heart-shaped, flat pendant on it every day. I only take it off to spray tan, and it has quickly become my signature piece. For the longest time, everyone asked where I got it. I didn't know because I had received it as gift. (Tough life.) By the grace of God, Instagram came to the rescue when Maya Brenner showed up on the Search page and I was able to identify the piece. Maya is an LA-based artist, known for creating designs that include letters, numbers and charms to personalize each piece. 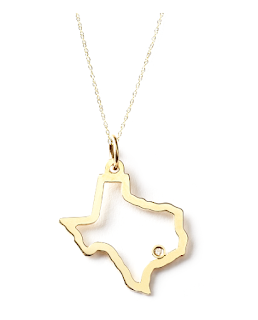 The State Necklaces are made with 14K gold and hang perfectly on the décolletage. They're perfect for someone who misses home or has pride in this home state. She also makes a pave option. The Iconery is a favorite amongst the fashion set, like Emily Ratajkowski and Chiara Ferragni. And the Striker sisters (Ashley, Jen and Kristie) are a favorite amongst celebrities like Mandy Moore and Emily Blunt. This collaboration includes a mix of their iconic "Striiike" logo, pieces inspired by their favorite vintage pieces that they've picked up around the world, and this necklace. 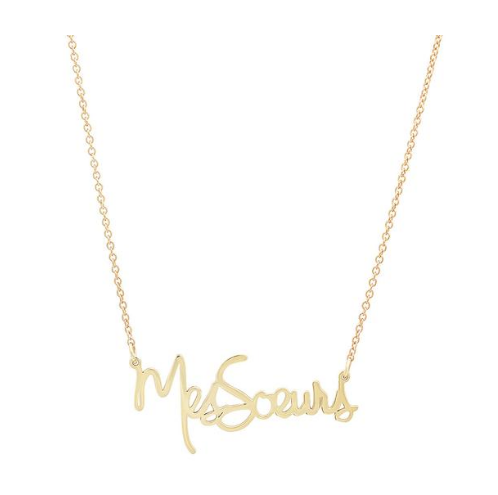 The Mes Soeurs necklace ("my sisters") was inspired by the electric pink sign that hangs in their Beverly Hills bungalow, and has taken on a bigger meaning since the election. "We're all sisters, in this together," said Ashley. 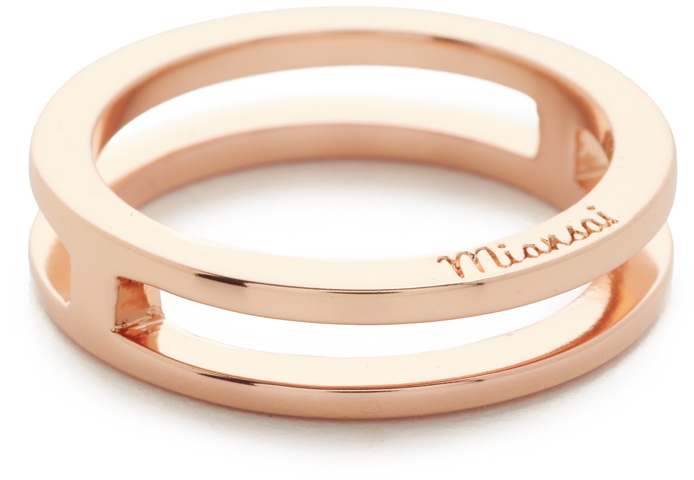 The entire collection is lovely, but this gift would be perfect for your siblings or your besties. I was introduced to Miansai two years ago and fell in love with the brand. Juxtaposing the idea that jewelry is supposed to be "feminine" with pieces that resemble hardware — many of the bracelets include a screw to fasten them — is a great twist. I personally love the bracelets, some of which are thick enough to get engraved. But the Split Layer Ring is an awesome accessory for someone who loves stackable rings, but doesn't want to risk losing one. The split of the piece makes it look like it's two separate pieces. For those of you who are having a full-on stroke regarding the prices of the first three gifts, perhaps some of these chokers are more in your lane. Chokers are considered a hot item among the millennial set (please note that I say this like I'm not one) and while some of them can look super cheap, you can find chic and edgy designs that are made well and sit at a nice price point, too. There are some expensive options here if you want to give a big ticket item. What other guides do you want to see? Let me know! I recently came across your blog and have been reading along. Nice blog. I will keep visiting this blog very often. Buy jewelry online at best price. These are the best collection of trendy jewelery for women which is mostly usable, I love to wear these jewelery. Anarchystreet is also the best online store to buy trendy Womens Jewelry at affordable price. Care ought to be taken on the off chance that it transforms into yellow or the punctured region swings to red, at that point you should look for quick therapeutic consideration.